Of all the planets in the solar system, Jupiter is the one that observers call the "King" of the planets. That's because it's the largest one. Throughout history different cultures associated it with "kinghood", as well. It's bright and stands out against the backdrop of stars. The exploration of Jupiter began hundreds of years ago and continues to this day with amazing spacecraft images. Jupiter is one of five naked-eye planets that observers can spot from Earth. Of course, with a telescope or binoculars, it's easier to see details in the planet's cloud belts and zones. A good desktop planetarium or astronomy app can give pointers on where the planet lies at any time of year. Jupiter's orbit takes it around the Sun once every 12 Earth years. 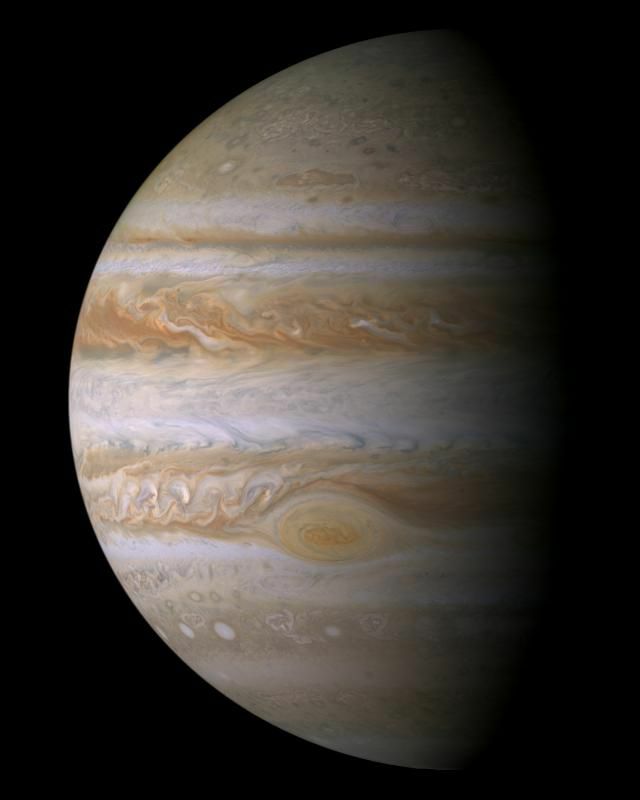 The long Jupiter "year" occurs because the planet lies 778.5 million kilometers from the Sun. The more distant a planet is, the longer it takes to complete one orbit. Long-time observers will notice that it spends roughly year passing in front of each constellation. Jupiter may have a long year, but it has a pretty short day. It spins on its axis once every 9 hours and 55 minutes. Some parts of the atmosphere spin at different rates. That stirs up massive winds that help sculpt cloud belts and zones in its clouds. Jupiter is huge and massive, some 2.5 times more than all the other planets in the solar system combined. That huge mass gives it a gravitational pull so strong that it's 2.4 times Earth's gravity. Sizewise, Jupiter is pretty kingly, as well. It measures 439,264 kilometers around its equator and its volume large enough fit the mass of 318 Earths inside. Unlike Earth, where our atmosphere extends down to the surface and contacts the continents and oceans, Jupiter's extends down to the core. However, it's not gas all the way down. At some point, the hydrogen exists at higher pressures and temperatures and it exists as a liquid. Closer to the core, it becomes a metallic liquid, surrounding a small rocky interior. The first things that observers notice about Jupiter are its cloud belts and zones, and its massive storms. They float around in the planet's upper atmosphere, which contains hydrogen, helium, ammonia, methane, and hydrogen sulfide. The belts and zones are formed as high-speed winds blow at different velocities around the planets. Storms come and go, although the Great Red Spot has been around for hundreds of years. One of the great discoveries from the age of Jupiter exploration has been the existence of a thin ring of dust particles surrounding the planet. The Voyager 1 spacecraft imaged it back in 1979. It's not a very thick set of rings. Planetary scientists found that most of the dust that makes up the system spews out from several small moons. Jupiter has long fascinated astronomers. Once Galileo Galilei perfected his telescope, he used it to look at the planet. What he saw surprised him. He spotted four tiny moons around it. Stronger telescopes eventually revealed the cloud belts and zones to astronomers. In the 20th and 21st centuries, spacecraft have whizzed by, taking ever-better images and data. Up-close exploration began with the Pioneer and Voyager missions and continued with the Galileo spacecraft (which circled the planet making in-depth studies. The Cassini mission to Saturn and New Horizons probe to the Kuiper Belt also swept past and gathered data. The most recent mission specifically aimed at studying the planet was the amazing Juno, which has gathered extremely high-resolution images of the amazingly beautiful clouds. In the future, planetary scientists would like to send landers to the moon Europa. It would study that icy little water world and look for signs of life.